THE UNTROUBLED MIND Canst thou not minister to a mind diseas’d,Pluck from the memory a rooted sorrow,Raze out the written troubles of the brain,And with some sweet oblivious antidoteCleanse the stuff’d bosom of that perilous stuffWhich weighs upon the heart? When a man tells me he never worries, I am inclined to think that he is either deceiving himself or trying to deceive me. The great roots of worry are conscience, fear, and regret. Undoubtedly we ought to be conscientious and we ought to fear and regret evil. But if it is to be better than an impediment and a harm, our worry must be largely unconscious, and intuitive. The moment we become conscious of worry we are undone. Fortunately, or unfortunately, we cannot leave conscience to its own devices unless our lives are big enough and fine enough to warrant such a‌ course. 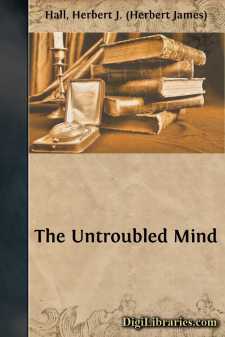 The remedy for the mental unrest, which is in itself an illness, lies not in an enlightened knowledge of the harmfulness and ineffectiveness of worry, not even in the acquirement of an unconscious conscience, but in the living of a life so full and good that worry cannot find place in it. That idea of worry and conscience, that definition of serenity, simplifies life immensely. To overcome worry by substituting development and growth need never be dull work. To know life in its farther reaches, life in its better applications, is the final remedy—the great undertaking—it is life. We must warn ourselves, not infrequently, that the larger life is to be pursued for its own glorious self and not for the sake of peace. Peace may come, a peace so sure that death itself cannot shake it, but we must not expect all our affairs to run smoothly. As a matter of fact they may run badly enough; we shall have our ups and downs, we shall sin‌ and repent, and sin again, but if in the end we live according to our best intuitions, we shall be justified, and we need not worry about the outcome. To put it another way, if we would have the untroubled mind, we must transfer our conscientious efforts from the small details of life—from the worry and fret of common things—into another and a higher atmosphere. We must transfigure common life, dignify it and ennoble it; then, although the old causes of worry may continue, we shall have gained a stature that will make us unconscious masters of the little troubles and in a great degree equal to the larger requirements. Life will be easier, not because we make less effort, but because we are working from another and a better level.